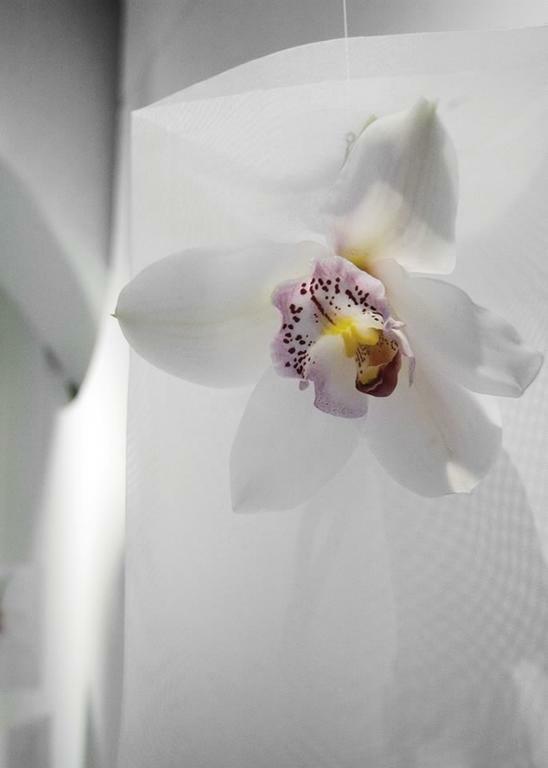 Materials: nylon, flowers, sounds, scented essences. Dimensions: m 10 x 5 x h 3. 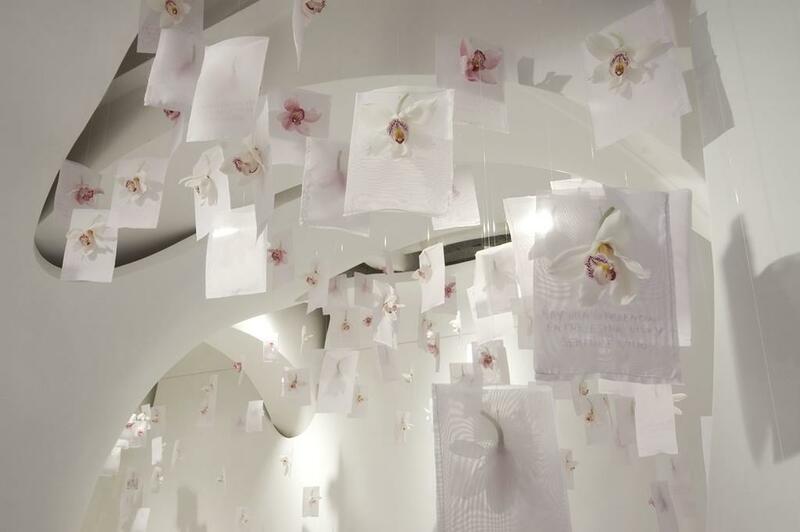 The biomorphic white space of the former Elettrofonica Gallery of Rome, for its inauguration, from the 12th to the 30th of March 2009, hosted the organza and orchids of a new incursion in space by Maria Dompè. The family history of the gallery owner Beatrice Bertini inspired the artist. “Hay diferencia entre estar vivo y sentirse vivo”: from Rome to Sanremo to Caracas and then back to Rome, this family has continually reinvented itself according to the sorrowful and joyous circumstances that life has presented to them; a family that has desired and known how to give vitality from country to country, amid encounters and experiences. The premises, where the exposition space is now located, were, exactly, the last enterprise of Beatrice’s grandfather: Elettrofonica “the premises where as a child I sneaked around discovering machines, cables, transformers and tools. Fascinating contraptions, incomprehensible and mysterious, the functions of which I ignored and precisely for this reason they became the vehicle for new thoughts, an opening to that which can only be imagined. Exactly what I think that art has always represented, far from a daily utility, yet close to the heart and to the possibility of imagining and of understanding some essential truth”, Beatrice Bertini. Just like it was for the family, this place has also been reinvented as a fluid and avant-garde space; a space where this work of Maria Dompè’s could be created and could exist with spontaneity. 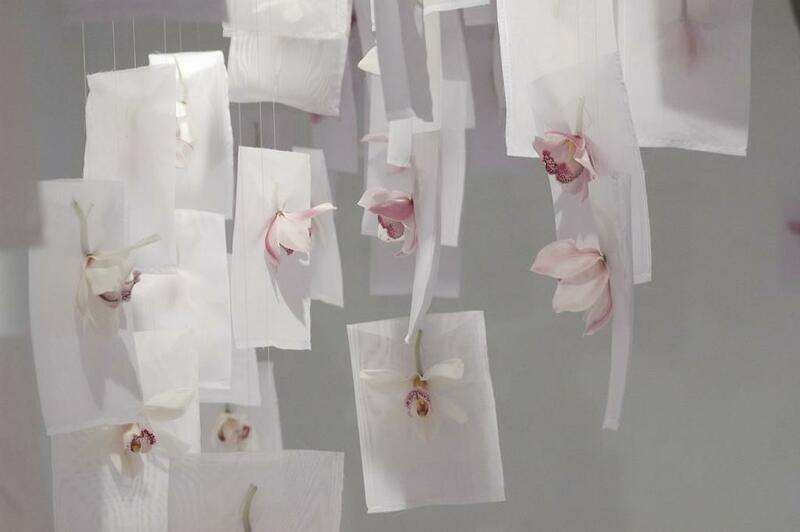 A dream image made with orchids attached to light rectangles of organza suspended with invisible nylon thread. A “garden of the heart” as the artist loves to define it, a garden of the heart’s memory we should add. A light but complete stroke of a mature personality: free from artistic self-adoration or rather “to mark”, with incisive but poetic effect, without invading a exposition space that has such a strong and successful architectural identity, the brilliant result of the duo of architects Belia and Bistolfi. 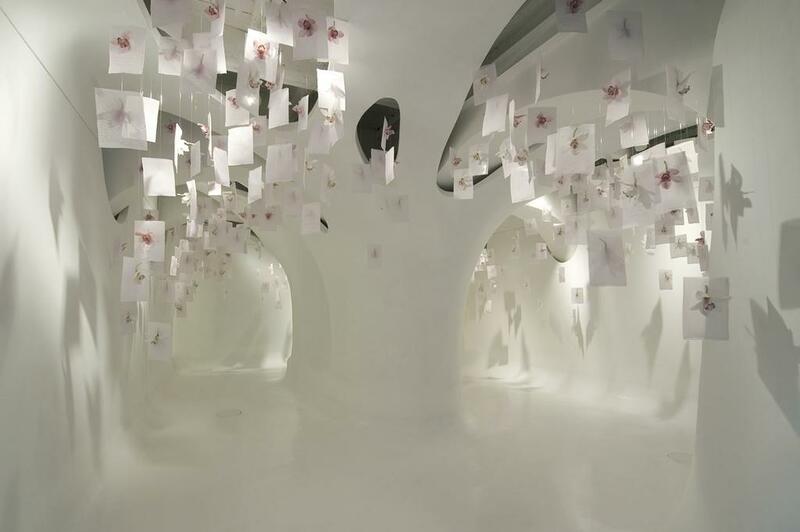 This work has made of the most innovative exposition spaces in the Capital poetic; it also desired to underscore the sensibility that is behind the history of each of us.